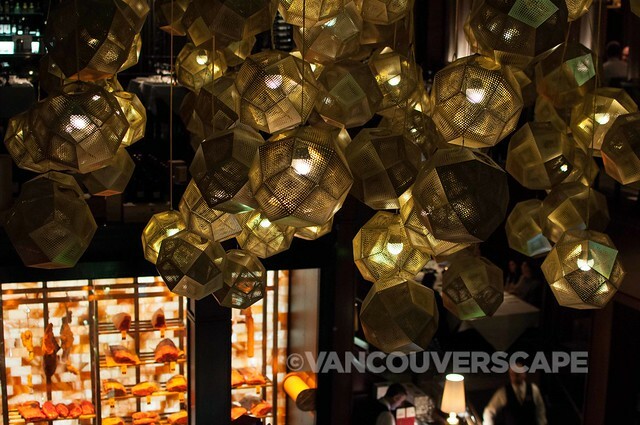 All seven Glowbal Group restaurants will be participating in this year’s Dine Out Vancouver Festival: Glowbal Grill, Coast, Italian Kitchen, Trattoria, Society, Black+Blue, and The Fish Shack. Last night, I was part of a group of media and local food writers invited to the Alberni Street Glowbal Group Dine Out tour, featuring Italian Kitchen, Black+Blue, and Coast. Due to another event earlier that evening, I only had the chance to try two of the three. Black+Blue’s $38 Dine Out menu includes a Mission Hill wine pairing with both appetizer and entrée, plus a glass of Prospect Admiral Okanagan Tawny with dessert, B&B’s Carrot cake (we sampled a grand finale dish of all Glowbal Alberni Street desserts at the end of the evening, at Coast Restaurant). The dinner starts with choice of two appetizers – Josper grilled vegetable napoleon with goat cheese, bell peppers, zucchini, and mushrooms, or loaded baked potato soup with double-smoked bacon, chive crema, and cheddar cheese. 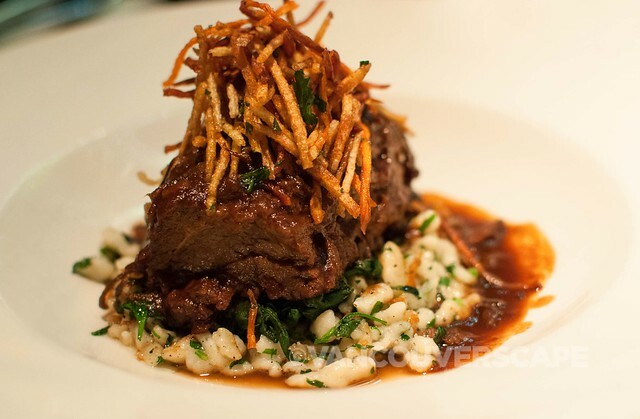 Slow-cooked Guinness braised short rib (with skinny pomme frites) is served atop greens and smoked cheddar späetzle, a rich and hearty compliment to a glass of Mission Hill ‘Reserve’ Shiraz (all dinner wines $10/glass). The layers of flavour and textures made this a winner in my mind. Although I did try the roasted trout with lobster bisque, lemon mascarpone and potato croquette, the aforementioned short rib seemed the most flavour-packed of the two. 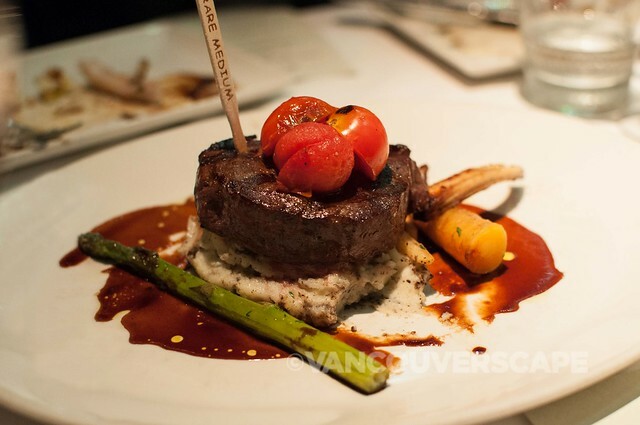 A third entrée option is a 6 Pepper crusted beef tenderloin, with truffled mashed potatoes, seasoned vegetables, and red wine jus. Entrées can be enhanced with 1/4 lb. King crab ($21.95), bacon-wrapped scallops ($11.95), lemon and garlic sautéed prawns ($11.95), or a 2 oz. portion of Dungeness crab meat ($8.95). Black+Blue is located at 1032 Alberni Street. 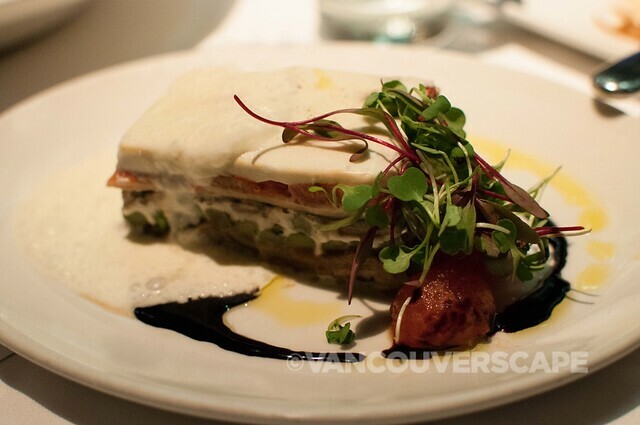 We moved along a couple of doors down to Coast Restaurant, at 1054 Alberni Street. 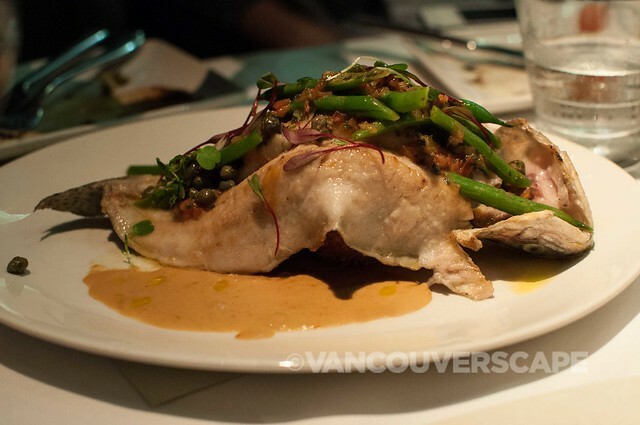 The majority of dishes at this Glowbal Group restaurant consists of seafood, so if you’re a fan of mussels and frites, sushi, salmon, or scallops, this is your Dine Out destination. 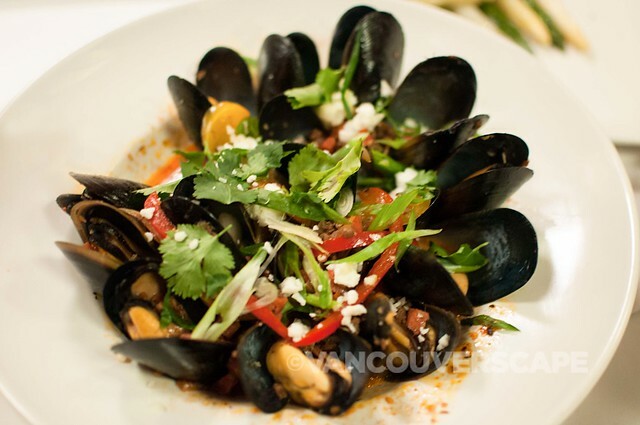 We sampled both the Spanish mussels (with chorizo sofrito, feta cheese, and San Marzano tomatoes, an interesting combination that actually tastes quite lovely) and winter chopped salad appetizers. 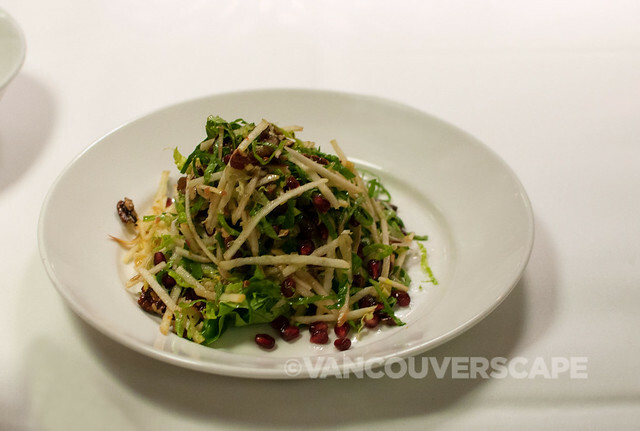 The salad is filed with goodness in the form of Fuji apples, Medjool dates, pomegranates, candied pecans, in a chili-lime vinaigrette. 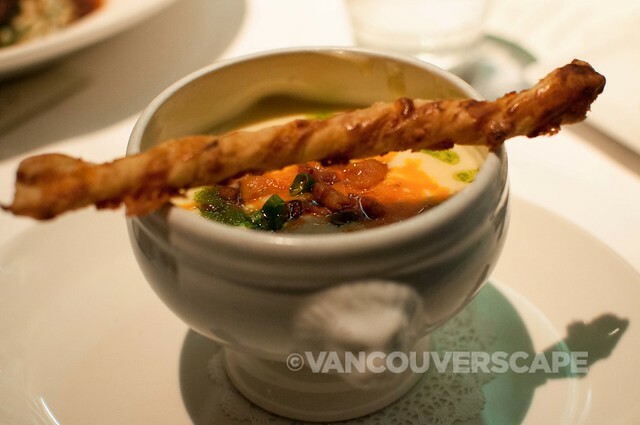 A third appetizer is Dungeness crab and sunchoke chowder, with crab tomalley, white miso, sake, mussels, and clams. Both appetizers have optional wine pairings both from Mission Hill: the ‘5 Vineyards’ Pinot Noir and ‘5 Vineyards’ Pinot Blanc (all dinner wines here too are $10/glass). Entrées include two more Mission Hill options: the Reserve Cabernet Sauvignon and Reserve Chardonnay, both well-paired for Salmon Two Ways and Grilled Alberta beef “Oscar Style” with whipped potatoes and prawn hollandaise. 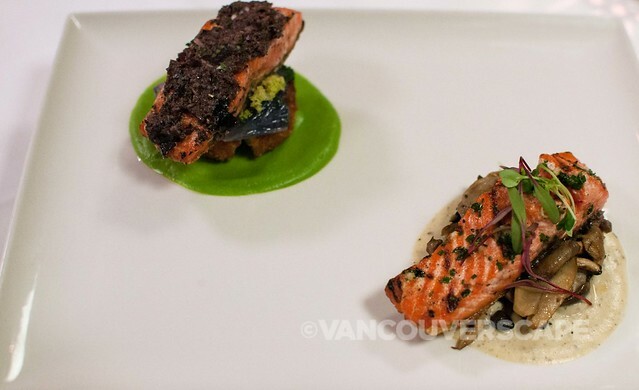 We sampled the Salmon Two Ways, one olive-crusted with a pea-basil purée and served with prawn and bacon croquette, the other a roasted salmon with truffled cauliflower purée and wild mushrooms. The presentation is beautiful and both salmon pieces are well-seasoned, their ingredients complimenting one another. Entrées can be enhanced with 1/4 lb. King crab ($21), 5 oz. lobster tail ($21.00) rosemary scallops ($11.95), or lemongrass prawns ($11.95). And now for those desserts! Coast features a Sugar-coated Taiyaki, cute little candied puff pastry fishes with assorted fillings and creme anglaise, served with Prospect Admiral Okanagan Tawny ($7.50/glass). The B&B Carrot cake with macarons was on the ‘grand finale’ plate as well as an apple Panna cotta, a drinking chocolate dipping sauce, and several swashes of sweetness decorating the desserts. It was nice to try all desserts in one place, as previous dining tours often have little to no time remaining to enjoy dessert before moving to the next destination. The fish is delish. Mine had ground nuts in the filling and the flaky crust is light and mildly sweet. 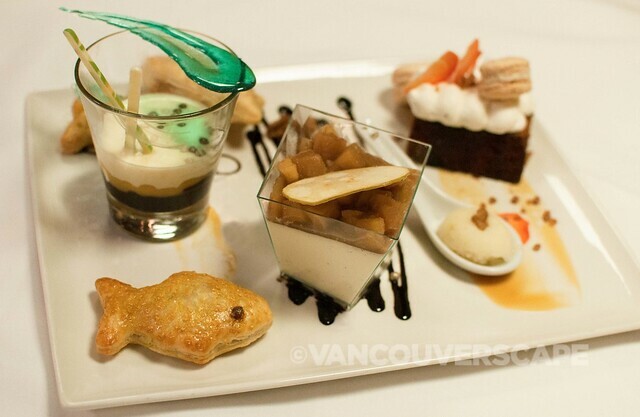 Dine Out Vancouver runs from January 17 to February 2. Visit the website for details.